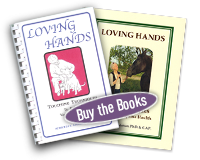 LOVING HANDS, Touching Techniques To Enhance Your Pet’s Health, is a transformational book authored and illustrated by Roberta T. Anderson, PhD., who is an Animal Health Communication Expert. She shares in her book the hands-on techniques to enhance the health and well-being of pets. Included in the book are treatment patterns that have been designed specifically to help relieve physical and emotional discomfort experienced by pets following an accident or surgery. Such occurrences can result in an imbalance in the pet’s physical energy, which can cause localized pain, depression, internal organ and glandular dysfunction, and/or inappropriate behaviors. 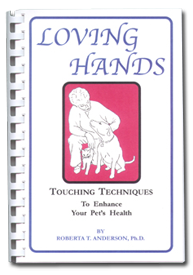 LOVING HANDS contains complete instructions to assist in the care of your pet including illustrations of how to apply the touching techniques utilizing several modalities including acupressure. It also includes instructions as to how to convey verbal and nonverbal encouragement resulting in a willingness on the part of your pet to assist in its own healing process. Recently Roberta has been working with clients who have horses and has found that the information presented in LOVING HANDS is easily adapted to the care of horses as well. Ideas presented in LOVING HANDS are not to be construed as a replacement for the care of your pet’s regular veterinarian or health care provider. Applications of the suggested treatment patterns are to be considered as a supplement to your pet’s current health care program. For more detail of what is included in LOVING HANDS CLICK HERE to view sample pages from the book. CLICK HERE to view the table of contents from the book. To order your very own copy of LOVING HANDS for just $22.50 + SH click the "Add to Cart" button below and fill out requested information. You will receive a confirmation email once your payment has been processed. In just 5 to 7 working days from the time your request and fees are received, Your Pet’s Health Will Be In Your Very Own Hands. My new e-book version of "Loving Hands: Touching Techniques to Enhance Your Pet's Health" is available now. For just $13.95 you can put your pet's health in your very own hands. 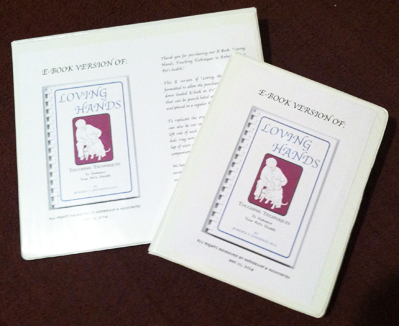 This E-Version of "Loving Hands" has been formatted to allow the purchaser to print out the down loaded E-Book on 8 & 1/2" by 11" sized paper that can be punch-holed at the top of each horizontal page and placed in a regular three ring note book. To replicate the original book design, the horizontal pages can be cut in half and punch-holed on the left side of each page and placed in a 7x9" three ring note book so that it can be laid in the lap of users as they apply the Touching Techniques on their companion animals. Click the button below to purchase a digital version of my book for $13.95.